CTC’s Model 5300 series programmable automation controllers can be simultaneously connected to one or more Fieldbus networks. BACnet/IP, Modbus master/slave, and CTC Binary communications are built into the CPU module. BACnet/IP is supported on the controller’s Ethernet ports. The Model 5300 supports direct connection to BACnet/IP protocol with no gateway required. BACnet devices may be integrated with devices and securely managed via a common interface over the Internet or wireless Intranet. The implementation of BACnet on the 5300 Blue Fusion controller allows the controller to act as a dedicated server, and/or initiate transactions as a client. As a server an external BACnet/IP client can access virtually any public variable or I/O within the controller as an object, either for monitoring or modification. In addition to standard BACnet objects, the 5300 controller supports full-time synchronization and multiple read/write. 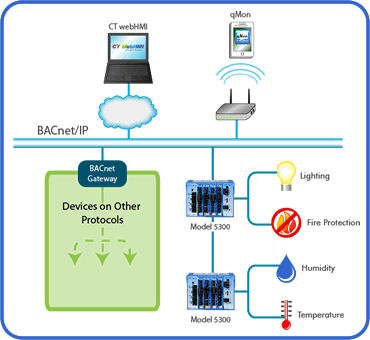 The BACnet protocol supports six types of networks. The CTC Model 5300 controller supports BACnet/IP, in which a standard BACnet message is encapsulated in an IP packet. BACnet/IP is efficient and scalable with broad applicability for a wide range of facility needs. Functioning as a BACnet/IP client, the 5300 will periodically send broadcasts looking for online devices with which to interact. The 5300 can interact with other BACnet-enabled devices and can establish a peer-to-peer relationship with other 5300 controllers on the network, using the BACnet/IP protocol.